When you have a new baby, advice isn’t hard to come by. From the moment your pregnancy starts showing everyone and their mother has something to say about how to avoid ruining your little bundle of joy. You have to breastfeed to improve your baby’s IQ. You can’t breastfeed because your baby will never learn independence. You have to wait until six months at least to introduce food, and you need to use BLW or they’ll never learn their body’s cues. You also have to introduce foods between 4-6 months, or they’ll never learn to eat. We’re all doing it wrong, and everyone wants to tell you all about it. The one thing that almost all new moms actually want help with? Baby sleep. Now, there’s no shortage of baby sleep advice out there, but I’m going to go out on a limb and tell you that almost everything you’ve been told about baby sleep is wrong. So today I’m sharing the best baby sleep hack that has worked with all four of my babies. It’s the one I wish more moms were told from the very beginning. I feel like there should be trumpets here, but I can’t figure out how I would spell an accurate trumpet sound.. Whatever. 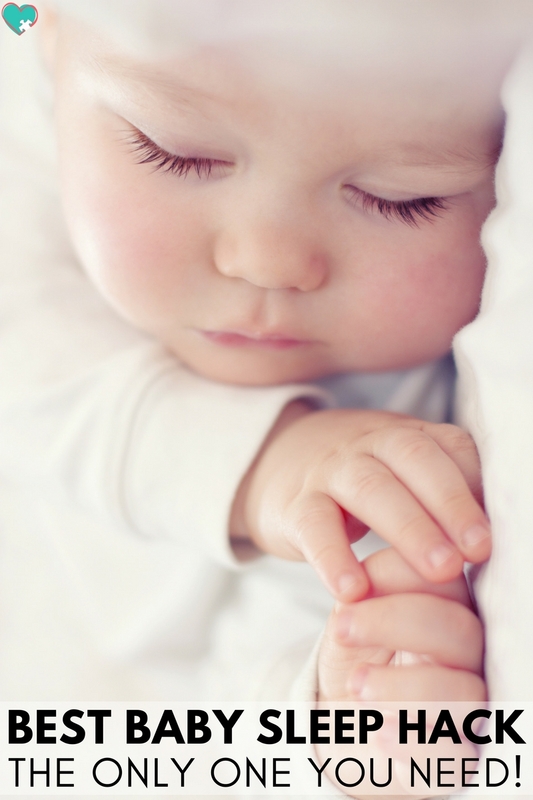 the best baby sleep hack is…. Do whatever gets your baby to sleep. Period. Okay, feeling a bit let down? I know, I know. You were hoping I would tell you one magical spell that makes all babies fall asleep in 26 seconds. Sorry, friend, that doesn’t exist. But, don’t give up on me just yet! If you follow my simple advice, do whatever works for your baby, it will work every time. Here’s the thing. 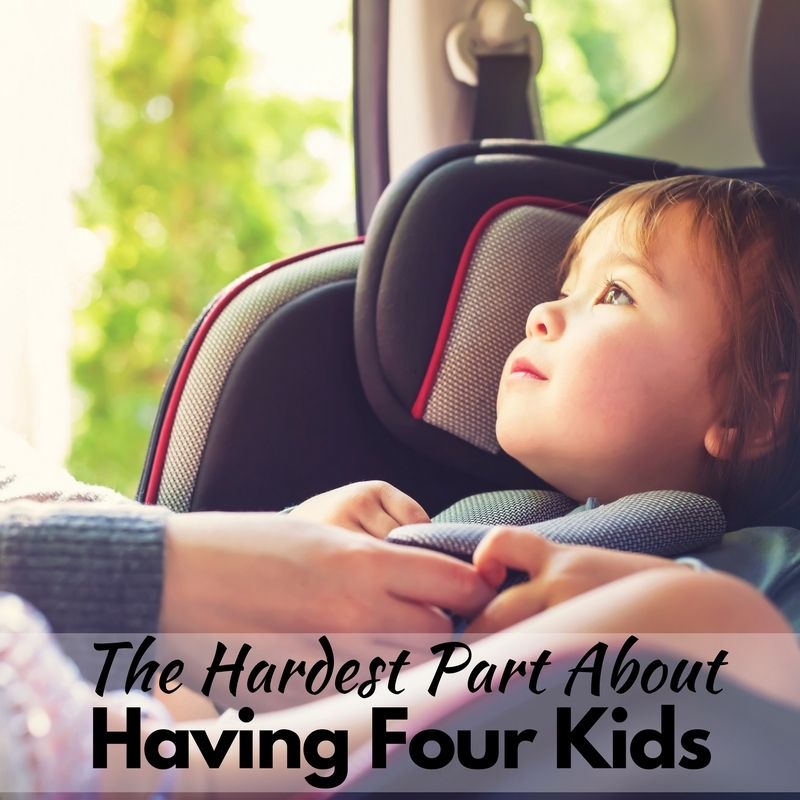 I’ve had four babies now, and all four have had different sleep habits. That’s perfectly okay. I am officially giving you permission to do whatever you can to help your little one sleep. Don’t worry about what the books say. Don’t worry about what the expert on daytime tv says. Do whatever you can to get your little one to sleep. 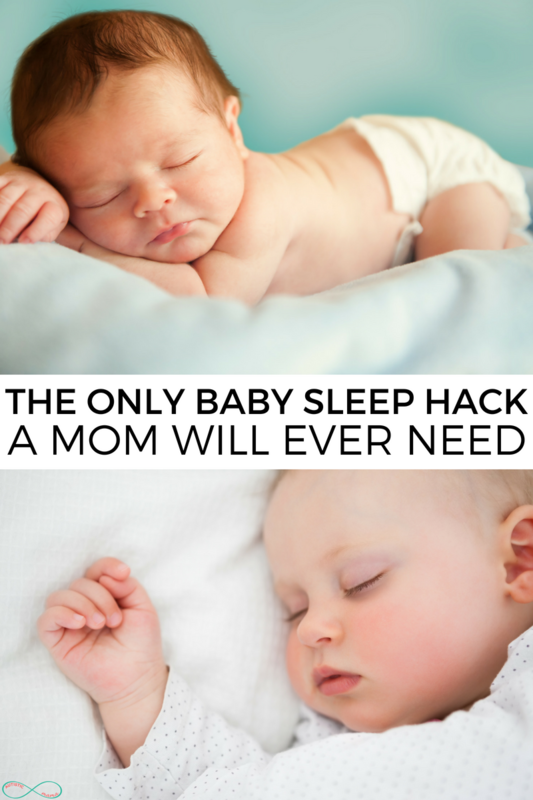 The only baby sleep hack you’ll ever need? Do absolutely whatever it takes for your sweet baby to get some sleep! Mr. C was a cosleeper at first. After a few months, though, he transitioned easily into his crib. That’s what worked for him. A-Man has always had troubles sleeping. We know now that it was likely due to his sensory struggles. For months I half-slept on the couch while he slept in his car seat on the floor next to me. If I stopped rocking his seat for even a second he would wake up wailing. He also slept well in the car, so we spent many late nights driving around. Eventually, he was able to transition into a crib, but it was only after several long months of doing everything we could to get him to sleep. Cap’n M was a die hard co-sleeper. He needed snuggles and nursing pretty much every single time he fell asleep. He moved into a crib eventually, and now he must go to sleep with a cup full of water, at least three crackers, and roughly forty-two stuffed animals. See the theme here? When you have this many kiddos, sleep is key, and you do whatever you can to get the kids to sleep. No matter the cost! I know, I know, “you should never ever let your baby sleep in a swing or they’ll never sleep anywhere else”. That would be some of the advice I’m filing under wrong wrong wrong. I highly doubt that Miss S will demand a swing when she goes off to college. Fact is? I’m fairly certain she has sensory struggles already, and if she’s happy in a very dark, very warm room swinging at the highest level her swing can handle, then that is exactly what I’ll do for her. Bottom line? I know the books and experts and all of the blog posts telling you exactly what you should do to not ruin your kid get scary. Especially when they all seem to contradict each other. The best baby sleep hack? Listen to your mama instincts, listen to your little baby, and for the love of all that is Holy, do whatever you possibly can to get that sweet little one to sleep! I love this! All so true. I found this to be especially true with my twins. I tried sleep training and quit. Writing on it soon :) I hope mamas really take this to heart because every baby is different with different needs they can’t speak out. Great post! Thanks Jeniece! It’s so true, every baby is totally different. I love this! We just had our fifth and I couldn’t agree more with what you say! My oldest slept in the swing for the 2nd 1/2 of the night until he was a few months old and he is the BEST sleeper now. I’m so happy I stumbled onto your blog! Amen. I could not have said it better myself! As a mom of a kid with sensory issues as well, there came a day when I had to throw all advice out the window and do whatever it took to get some sleep! It’s also a pretty good mantra to carry over throughout the day. Whatever it takes to make it through, because every child is different! You are so correct! Whatever helps everyone survive. haha! My son Liam is all most 1 year, in 10 hour’s ? and at beginning of his life I was trying to do my best like on The Book. ??? but I realised very quickly that this will not work. The same think was with my doghter wich now is 15. So, if he want to sleep when on my Samsung is playing an app with baby music then let him sleep like that. Any way he sleep with me in the parents bed and his dad just taked the baby room. And is fine for all in the house. He is not crying all night like then when I was trying to force him to sleep in his room. I can be with him when he is wakeup and this help him to sleep right back. we ( me and his dad ??) have the small room but is soo cozy and we enjoyed ??? The answer is Yes, your solution: Do whatever gets your baby to sleep. ?? And we are a happy family wich don’t care what other say. ? ? about rules. Just be always there for your baby and they will thank you later. I got this from my doghter. A lot of love ?? PS: sorry for my writing and grammar but I m just 1 year old in English ? Goodness thank you so much for writing this. I found it on Pinterest and when I clicked I was expecting yet another website that was going to say “put baby down drowsy but awake…never nurse to sleep…etc etc.” It’s so hard to follow my instincts and just do what my baby needs when there’s hundreds of books and websites all saying different things and making me feel like no matter what I’m doing everything wrong. This was so refreshing to read. Thank you! This made me feel so much better. My first born transitioned to her crib at 8 weeks and slept 10 hour stretches. I thought I was a sleep expert so when my second baby came along and slept 6 hours on night one, I thought, I really got this! Now a week away from turning one, he does not sleep through the night still. Sometimes he wakes up once sometimes twice a night. The only way to get him back is to nurse him. And then come the comments….”you should never nurse your baby to sleep.” “Put him down awake and let him cry”. “He doesn’t need you to sleep.” Ugh it’s so frustrating! I keep telling myself my 3 year old sleeps and so will my son one day. Today is just not that day. But thank you for making me feel like that’s okay. He won’t need to nurse to sleep in college. That’s what I always say! Do what you can to get your little one (and yourself) some sleep, Mama. You’ve got this! Hi Kaylene, these are great tricks! I’m totally agreed with you on “Swinging your baby to sleep”. It works out wonderfully well for me. Great write up! We just had our third and I couldn’t agree more with what you say! My oldest slept in the swing for the 2nd 1/2 of the night until he was a few months old and he is the BEST sleeper now. I’m so happy I stumbled onto your blog! My son is 5 1/2 months old has heartburn and sleeps on his swing every night. In your opinion is there an age I should really start pushing him to sleep in his crib or will it just all work out in the end? Thank you so much for this article, I was feeling so guilty that he still sleeps in his swing and reading this made me feel better. All of these articles can make you feel like you’re failing at everything but this one made me realize I’m putting his unique needs ahead of what I think he should be doing, or what some article thinks he should be doing. Thank you for that! I wouldn’t stress about it unless he gets too big for his swing! I pinky promise, he won’t go to college sleeping in a baby swing. <3 I am so glad this made you feel better. You're a great mama! My princess is 6 weeks old today.. and let me tell you the screaming and fussing is persistent this last week. And according to “google” she in the “peak of fussiness for a newborn.. and I’m trying to do everything “right” but the first 5 weeks she would sleep about 5-6 hrs and I would actually have to wake her up to eat and shed crash back out and now it’s about the opposite and I’m spending hours trying to get her to nap. I’m only 22, and this is my first time around and I’ve had one of the hardest days yet today and I care across your blog and I just wanted to thank you. Because she went from sleeping in her bouncer all night to co sleeping just so I could get maybe two hours of shut eye. I’m not even thinking a crib right now, just how to get us all a little sleep so we keep our sanity! Thank you so much for this whole post! I am a new mom and my 4 month old is not the best sleeper. Everyone tells me it’s because I hold and rock her until she falls asleep or because sometimes I nurse her until she falls asleep or I don’t put her in her crib to nap all the time. I never feel like I’m doing things right. Reading your post almost out me to tears. I am doing this mom thing as best I can and you just reminded me of that! Thank you thank you thank you!!! Gotta tell ya, your blog is wonderful, refreshing and in a way, actually comforting. I am a mother of 2 beautiful girls, 5 & 9 who deal with the struggles of autism & sensory processing disorders, both at different levels of the spectrum and are nonverbal & not-so-verbal typical levels of communication. Both are still in diapersAmidst the emotional breakdowns, I have grande Mal epileptic siezures, depression, anxiety & side effects of 6 (nonworking) different medications. I am a stay-at-home mom who values the moments I spend with my girls & knows I’m pretty darn lucky to have what I do. I have designated time, (yes even during summer) I have the set evening routine of dinner, homwork, bath, book, medicine, 30 min episode from Nic Jr then bed by 8. They know exactly what is to come and it seems to make them more at ease and in control of what’s to come during the day. It’s what we want for our kids. As a mother of 5, one of which has a diagnosis of autistic challenges and through your blogs, I know there is someone else out there with similar challenges to mine. It’s so wonderful to know it’s ok to ignore the advice that may work for others isn’t what I do. Soothing meltdowns, different ways of aggravation and the approach to gain control. Funniest thing you’ve ever seen seeing a 5 ft woman rocking a sobbing 9yr old on her lap singing tears in heaven together. I can honestly say that I went from being completely overwhelmed, burnt out and not much fun to be around to a parent-friend and teacher, my girls could have nowhere else and this is because of a confidence boost in a blog I stumbled across. I just wanted say thank you and I consider you another amazing find along the way. You just keep writing and I will definitely keep reading! Thanks again!